Kill Black Algae In Your Swimming Pool. How To Easily Do It. Removal of black algae. 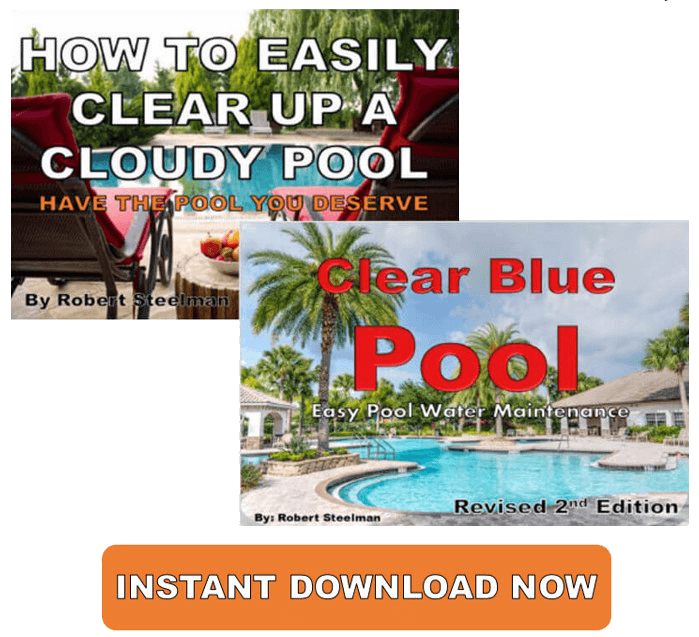 Swimming pool maintenance tips and chemical maintenance to get rid of a black algae pool to give you the pool perfect for you. You need to get right on this because this bugger, if left on its own, can eat a hole right through your concrete. It's rare in vinyl and fiberglass pools. It can happen, but concrete and plaster pools are particularly vulnerable due to their porous nature. Properly balancing all of your pool’s chemicals and normal swimming pool care will greatly reduce, but may not eliminate the opportunity for getting green pool water, cloudy pool water, pink algae, and yellow algae. Having your swimming pool chlorine, alkalinity, and hardness adjusted correctly is very important. Remember to brush and vacuum your pool because this will reduce the dirt accumulation and algae pores from sticking to the pool’s surface. Always take the proper precaution in dealing with these types of chemicals and read the manufacture’s labels. Use heavy duty rubber gloves and goggles and keep pool chlorine out of reach of children and pets. Now, anything over the pH level of 8.0 and you're only using about 25% of the chlorine, which means, you've lost 75% of the active swimming pool chlorine. When you add your pool chlorine, your pH will automatically go up, so get that pH down!! Remove and wash bathing suits, toys, floats and anything else from the pool. Wash your bathing suits in a washing machine and dry them in your dryer. Wipe down everything you removed with a 50/50 solution of bleach. You can use a scrub brush for more thorough cleaning. Place your pool cleaning equipment (telescopic pole, net, brush) in the pool so that it becomes sanitized. Bring the pH, alkalinity, and hardness into line. Adjust your pH to 7.0-7.2. Chlorine is more active at a slightly lower pH level. Alkalinity to 80-120 ppm, and hardness to 150-250 ppm. This cannot be stressed enough. Black algae has tentacle-like-appendages which drill into the plaster. A wire brush is the only way to remove it. Remove as much debris as possible using a good wide-mouth leaf rake. 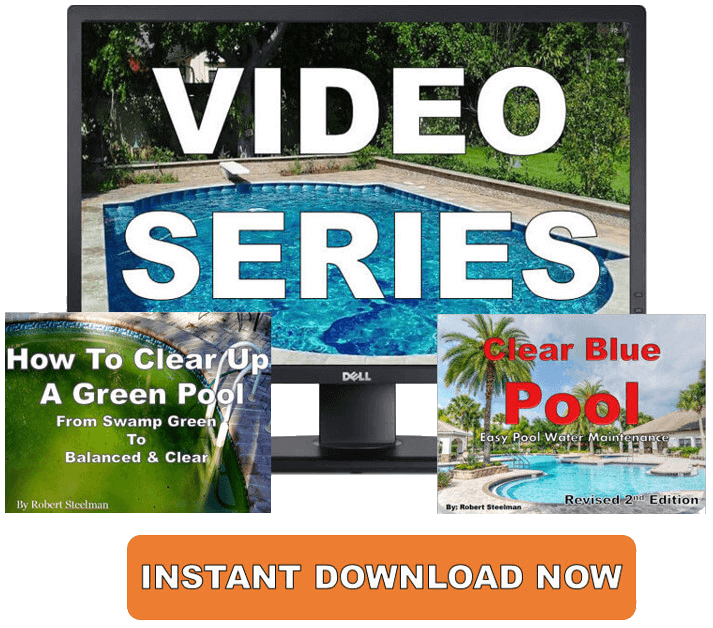 Watch the video below to see the proper way of shocking your pool. 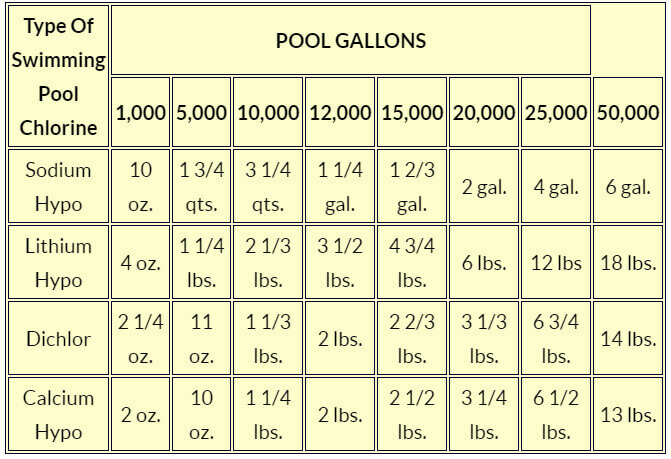 Increase and maintain a free chlorine level of 15 - 20 ppm using liquid pool chlorine or bleach. Another technique that works well is to crush up chlorine tabs and add it to the black algae areas. Crushed up tabs won't dissolve as quickly and will stay on the area longer. Yes, you heard that right. You'll literally be grinding the chlorine tab into affected areas. A good tool for this job is called Algae-Gon-Tablet Holder. Get some calcium hypochlorite and sprinkle a thin even layer on affected areas such as steps, bottom, and love seat. Allow this to sit for 24 hours. Keep the pump motor on 24/7 until the water clears. Make sure you wire-brush your pool at least a couple times per day to keep the black algae from adhering back onto the plaster. The algaecide you want to get is a bit on the expensive but it's worth it It's called a "PolyQuat 60". Never use a metal algaecide such as copper. You don't to add anything else to the pool. Keep brushing with a heavy duty wire brush. Doing this will loosen up the algae and help the chlorine penetrate the spot. Remember, swimming pool black algae has layers so you want to get as many layers off as possible before adding the chlorine. This is for a concrete pool (gunite swimming pool) and not vinyl swimming pools as this may tear your vinyl liner. 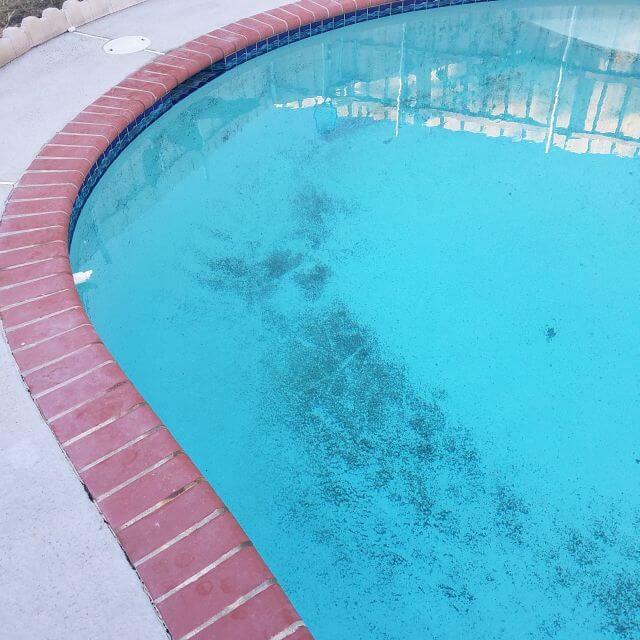 Black algae is mostly for concrete and plaster pools. In can happen in vinyl pools but it's rare. You have to get mean with this because it will show no mercy for you. Grind it in, so to speak. Also, take care in using direct chlorine on your vinyl liner as it may bleach or stain the vinyl liner. 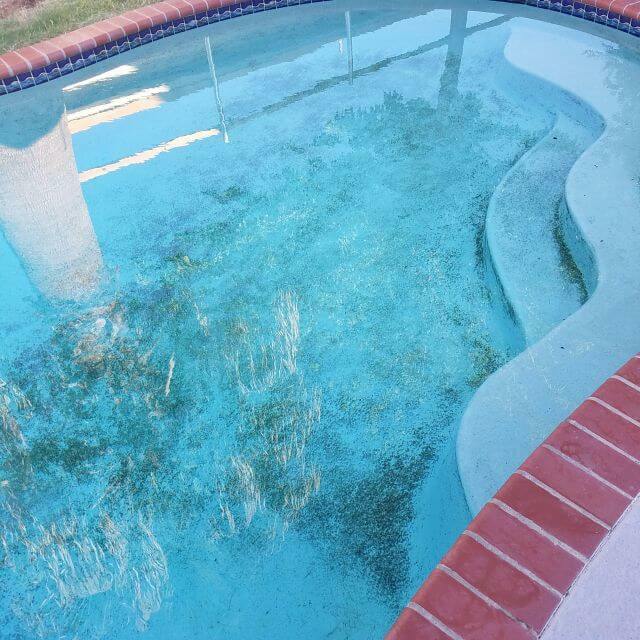 Add the pool chlorine around the perimeter of the pool and allow the filtration system to run for another 24 hours. Vigorously brush your pool as often as you can. You have to get that black algae up from the roots. Allow your system to run until the chlorine is down to 2 -4 ppm. Once the chlorine is down to a safe level and your swimming pool chemistry has stabilized, you may see some etching in your plaster from the pool algae. You may need to get a sanding block from your local pool store and sand the areas where the black algae used to be. Well, there you have it. I told you killing algae wasn't going to be fun, but if you have a pool with black algae, you gotta get nasty with it.